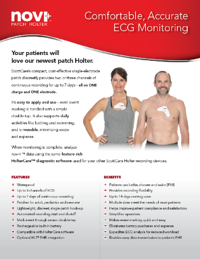 ScottCare is proud to introduce our novi+ patch Holter to the CardioView Dx diagnostic suite. It’s lightweight, convenient and patients love it. Download the novi product sheet now and learn more about its features and benefits. Download the novi+ product sheet and learn the benefits of patch Holter monitoring with ScottCare!